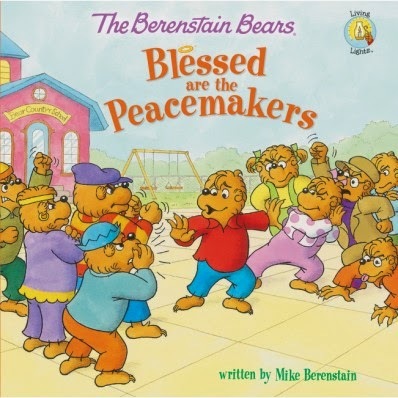 "In this new Berenstain Bears 8x8 book, Blessed are the Peacemakers , Brother and Sister have a wide circle of friends at Bear Country School and they get along with pretty much everyone. But not all their friends get along with each other. Too Tall and his bullying gang, for instance, are often in conflict with Cousin Fred, Ferdy Factual, and their friends. So what happens when the cubs all need to work together on the annual school play? Brother and Sister have to decide whether they should “mind their own business” or get involved as peacemakers and try to calm the troubled waters." I continue to enjoy the Berenstain Bears Living Lights series, an encouragement to my young readers/listeners and to myself. Too Tall and his gang are at it again, causing conflict among the bears and their friends. These guys have been causing some trouble for as long as I can remember! Brother and Sister Bear seem to have a knack for helping their friends get along though. The annual school play is The Story of Romeo and Grizzliet, and it helps to bring the rival friends together.. at least for the play. The adults have to get into the action to help teach Too Tall what peace making means and how it is never ok to start a fight. The end of the story has some activities and questions from brother and sister bear to help talk about the story. There are also suggestions on family activities.